This bow set is for the little bit older girls. 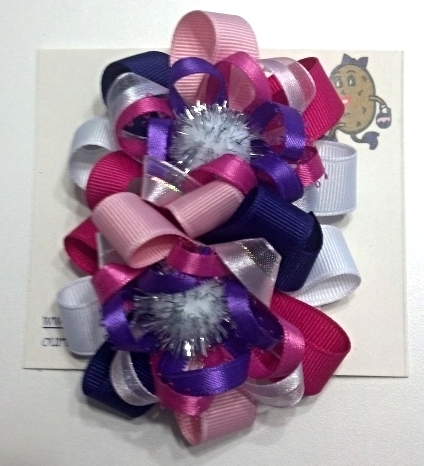 The purple, pink white ribbons are on a 2-1/4" metal barrette and will go with several of the Gymboree lines including Super Star. There's a cute 1/2" sparkly pom-pom in the center. Set of two. All ends of every ribbon are heat sealed to prevent fraying. With postage being as high as it is this is as low as the price can be. Between selling fees, paypal fees and postage the asking price of the bow leaves very little profit once the cost for ribbon and other supplies to make this are factored in.